Here’s a familiar scenario: Your best friend from college is finally coming to visit. She’s never been to Portland — or Oregon, for that matter — and she wants to check out what all the hype is about. This woman is a true fashionista, so she’s going to want to hit the local boutiques. Where to take her? I’ve been a personal stylist in Portland for more than 11 years, and I hear this story all the time. Here’s a day trip of local boutiques with stops along the way to enjoy Portland’s delicious food and drink. 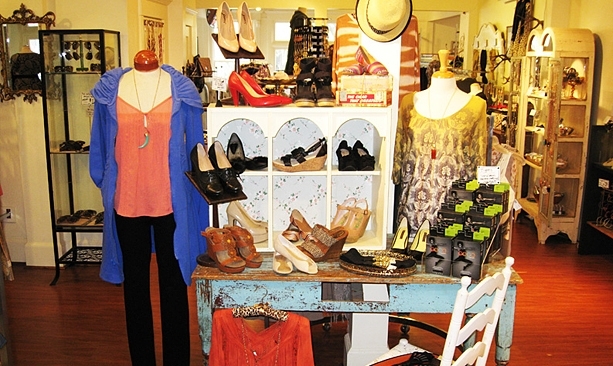 Tumbleweed Boutique carries boots, shoes and women’s clothing. Stop for breakfast at Petite Provence. Start the day with a Champagne cocktail and a brioche at Petite Provence on Northeast Alberta Street. Then hop a few doors down to Tumbleweed Boutique to scope out the clothing line Kara-line, a favorite of local women. The dresses are made with the most beautiful of fabrics and are cut to flatter a woman’s shape. 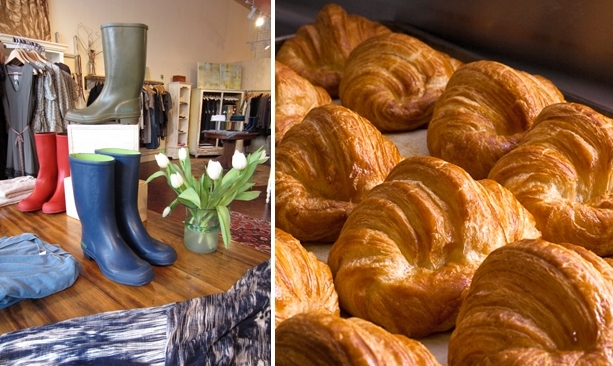 Then wander down to Amelia, a neighborhood dress boutique that showcases designers and artists from across the country. Next, head over to Northeast 42nd Avenue and Northeast Fremont Street to Shop Adorn for nationally acclaimed local design labels such as the Portland Collection from Pendleton Woolen Mills, with their distinguishable cardigans, separates and accessories. Shop Adorn also carries Prairie Underground, a casual but contemporary label of pieces that you won’t want to take off. Don’t leave without picking up one of the Ellington handbags, especially if you’re looking for a well-made, well-priced, everyday bag. Amenity Shoes is right around the corner. 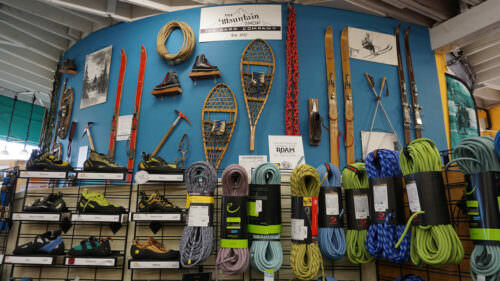 They carry some of the finest shoe brands with an emphasis on exceptional quality, great design and comfort. Who doesn’t love a pair of shoes that are gorgeous and comfortable? Amenity Shoes carries fine shoe brands with an emphasis on exceptional quality, great design and comfort. Don’t miss Imelda’s Shoes and Louie’s Shoes for Men on Southeast Hawthorne Boulevard. You’ve probably worked up an appetite by now. Cool your jets and treat yourself to a margarita and fresh tacos at ¿Por Qué No? Taqueria on Southeast Hawthorne Boulevard. You’ll find several fantastic boutiques on and around this street, including Buffalo Exchange, a consignment store, and Imelda’s Shoes and Louie’s Shoes for Men. Don’t miss Communion, where you can shop for the man in your life (and you’ll probably find something for yourself, too). Presents of Mind, a novelty shop, is the place for high-quality, memorable souvenirs that will actually be appreciated, even coveted. Pick up a stylish T-shirt with the silhouette of one of our iconic bridges or an “I Love Oregon” duct-tape wallet. Hop on one of our famous bridges and head across the Willamette River to Pioneer Courthouse Square, the heart of the city, to start your shopping on the west side. Before you hit the stores, grab a cup of coffee, take a seat on the steps of the Square and people-watch for a bit. It’s truly a melting pot of locals, as well as visitors, and there is always something going on in the Square. Once you’re caffeinated, walk a couple of blocks up to Frances May, on Southwest Washington Street. 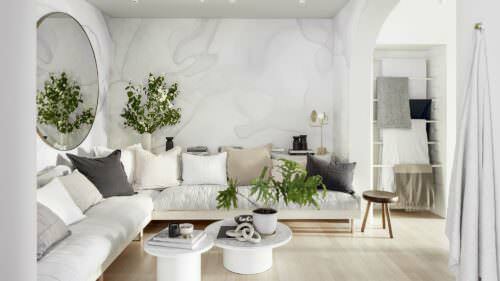 Here you’ll find carefully curated modern silhouettes with nostalgic charm. They carry the finest of local talent, plus labels such as Rick Owens and Rachel Comey. From there, wander up to 12th and hang a right to cross Burnside, which will land you smack in the Pearl. If you’re looking for modern, fashion-forward clothing and accessories, you’ll love Garnish. You can shop on your own, or set up an appointment with a personal stylist. Head to Director Park to peruse the new Pendleton Woolen Mills’ new flagship Portland store. Here you’ll find a curated selection of home goods, men’s and women’s apparel and plenty of iconic wool blankets. Sloan Boutique and their sister store, plaTform, are go-tos for retail therapy; you can find an armful of exciting pieces without breaking the bank. 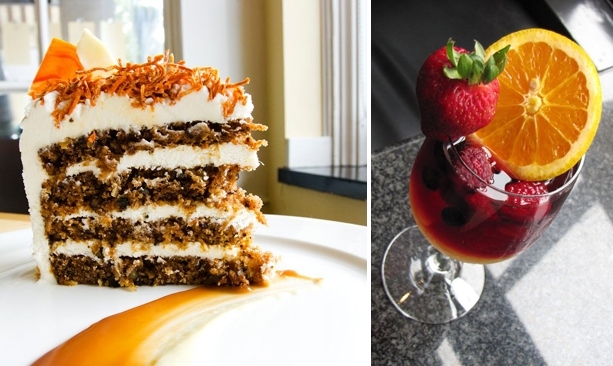 End the day with dessert at Papa Hayden and drinks at Jo Bar & Rotisserie. 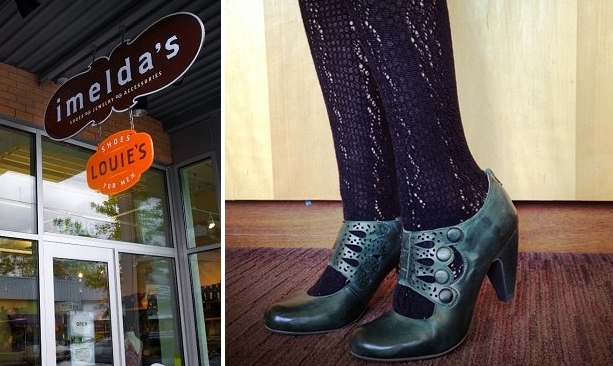 Last stop for shopping is Portland’s beloved Northwest 23rd Avenue. 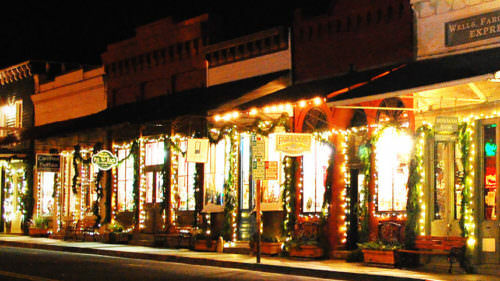 The street has such charm, especially in the fall and winter, when the holiday lights are up and twinkling. 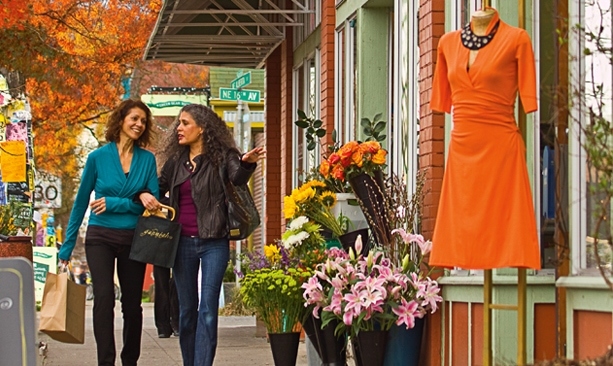 Check out national retailers like Free People and prAna, but don’t miss the locally owned stores that give this street its personality. Gem.Set.Love carries the largest selection of vintage and antique jewelry in the entire Pacific Northwest. Sloan Boutique and their sister store, plaTform, are go-tos for retail therapy; you can find an armful of exciting pieces without breaking the bank. At this point, you’re likely to be all shopped out. Head to Jo Bar & Rotisserie, a cozy restaurant and bar where you can find the best gourmet burger in town. End your epic day with a dessert from Papa Haydn next door. Get the toffee cheesecake — it’s heaven in a bite. 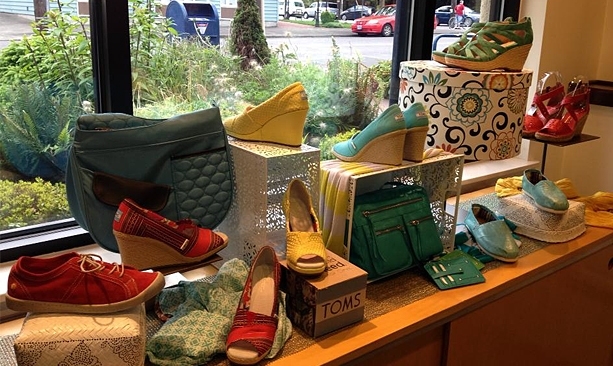 Portland has so many amazing boutiques, and this tour should give your guest a taste of what our talented city has to offer. Be prepared, though: After this day of shopping, she’ll certainly be back.